Instrumental albums tend to fall into one of two categories. The first is the hourlong symphony, in which a composer, usually a person used to working with a much smaller band, records a suite of songs with the aid of a roomful of musicians. The second is the medley of solo pieces, which depends on the composer’s ability to work well with economy and spareness. 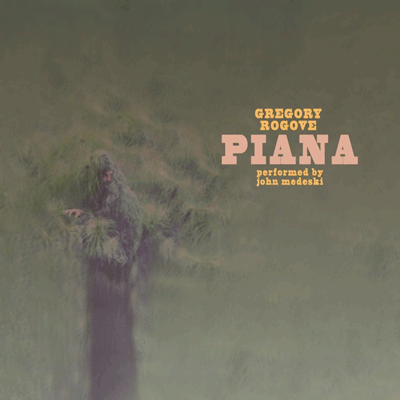 The first solo album by Gregory Rogove, Piana, sits firmly in the latter category. A collection of piano pieces written by Rogove and played ably by John Medeski (of Medeski, Martin and Wood), Piana fuses together a number of disparate song structures, each of which adds to a dominant mood of regret laced with hope for redemption. Veering deftly from tempo to tempo, from dirge to bolero to elegy, the album tracks the thoughts of a melancholic man who wants to know how to bury his mistakes. Upbeat tracks like “Jackyl” lend a manic edge to his musings, while eight-minute closer “Young Mountain” suggests his eventual resignation. All in all, it speaks to Rogove’s talents as a songwriter that Piana, despite its variety, communicates a singular loss.